Solve this genius math puzzle. Brainteasers math puzzle only for geniuses images with the answer! Hi, check out this confusing math puzzle. Question and puzzle image are given below, share your answer via comments. best of luck! 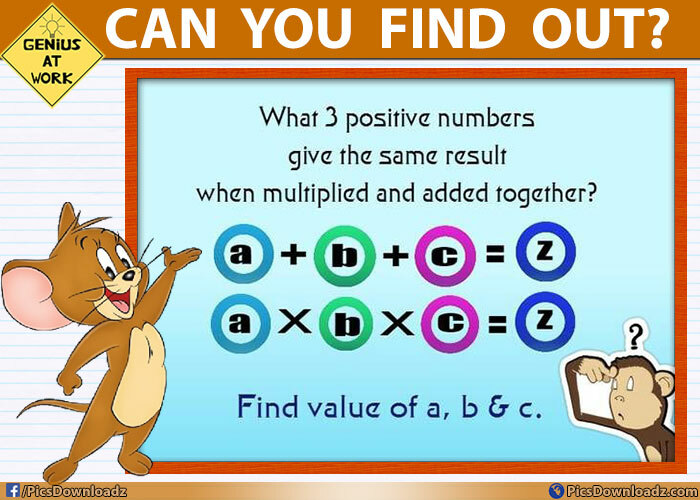 Question: Which 3 positive numbers give the same result when multiplied and added together? Find the value of a, b and c.
Got it? share your answer in comments. Check the answer at the end of the post. Don’t forget to like us for more interesting puzzles and viral stories. Do you have any other numbers? Feel free to share!